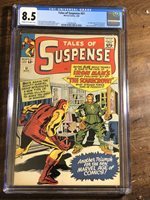 Tales of Suspense #51 - Cgc 8.5- Marvel 1964 - 1st App/ORIGIN of Scarecrow! 1965 X-MEN 7 CGC 9.0 - 2nd APP BLOB! KIRBY COVER! Worldwide SHIPPING PEDIGREE! CAPTAIN MARVEL #8 VERY HIGH GRADE !! (1968) MUST SEE PICS !! YOGI BEAR JOINS THE MARINES,FC #1162,DELL 1961,VG- COPY!